Elite campuses cannot continue to empower toxic and violent men. The independence movement has a branding problem. It could happen here — it has happened here. Emotions dominate the stand at the Kavanaugh hearing. On the two sides of Greek life and social spaces at Dartmouth. How does 63 percent of the senior class end up in finance, consulting or tech? There is a fine line between fitting in and losing oneself. Women of Dartmouth, it’s time we got a bit angry. ISC rush must evolve to allow women more agency in the process. How I tune out the voice in my head and all the other ones, too. As Iran and Saudi Arabia vie for influence, does America know where it stands? Blindly viewing education as the path to the American Dream has irrevocable consequences. Being drunk is not an excuse for violating moral or legal principles. Would it be a waste of time to think too much about getting wasted? Finding my own small dictums in the day-to-day. When socially awkward girl catches up with friends on the green. Some tips for thinking about that ominous void called your future. Hong Kong is coming home, whether it likes it or not. 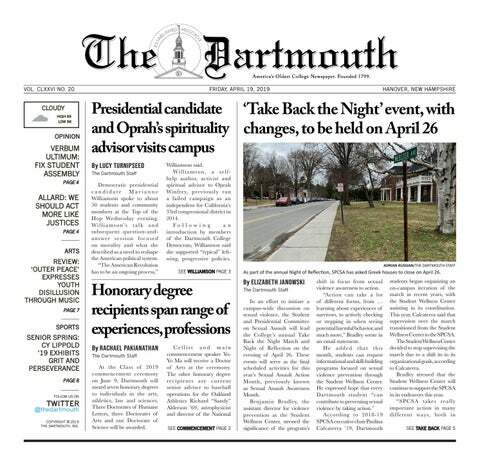 Dartmouth cannot continue to meander around its housing issues.